Pedestrian accidents are unfortunately becoming increasingly more common as more individuals opt to take the “walking” route over the driving route. Vehicle drivers often do not expect to see pedestrians on the roadways, which means they either turn without checking for pedestrians or otherwise remain ignorant of pedestrians on the roadways. If you or someone you know has been involved in a pedestrian accident and now has injuries, there may be some compensation available.Let our motorcycle accident attorneys help you. In 2014, there were a reported 8.838 pedestrian accidents, which represents a slight increase in the number of pedestrian accidents which were reported in 2013. Out of this number, only a minimum percentage of the accidents resulted in fatalities. However, the majority of injuries which occur to pedestrians are often severe and can result in weeks, if not months, spent in a hospital recovering from injuries. Pedestrians do not have the available protection of a steel frame, or even helmets, and especially vulnerable when involved in a car accident. The highest number of pedestrian accidents occurred within Miami-Dade County, a pedestrian friendly city. However, Miami also contains a large number of tourists who speed through the city without paying particular attention to the pedestrians on the roadways. Unfortunately, this can result in severe injuries to any pedestrians, who do not have any way to protect themselves from the impact of a multi ton vehicle barreling at them. Florida is known as a comparative negligence state, meaning that if a victim is a percentage responsible for the resulting injuries, the amount of damages the victim could receive could be limited. For example, if a victim crossed at a crosswalk which was not green for the pedestrian, this could play a role into the extent the victim is found liable for the accident. However, vehicle drivers should always yield to pedestrians and therefore the vehicle driver could still be found responsible, regardless of the actions of the pedestrian. A well-known and valuable experienced accident attorney will assist with calculating the damages which you are entitled to receive following an accident, including projecting the amount of future damages, such as future earnings. It’s vital to refrain from speaking with the insurance company prior to speaking to an attorney. Insurance companies will attempt to coerce you to accept their settlement offer, which often does not take into account a vast majority of your medical expenses and future expenses. Once you sign a settlement offer, you may be precluded from bringing a claim in the future, and it is critical to discuss this matter with an attorney prior to accepting the offer. 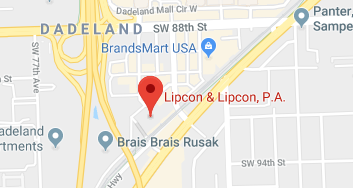 Whether you or someone you know has been involved in a pedestrian accident, reach out to us at Lipcon & Lipcon. Our lawyers have extensive experience in handling the issues involved with automobile accidents. Pedestrians are often attempting to take the healthier alternative to get to their home or place of business. Contact our Miami, Florida office to begin your case with a free consultation.